In a commendable attempt to liven up the blogging silly season Alex Ross nominates a CD of Wilhelm Furtwängler's Piano Quintet as the worst recording ever made. Never one to refuse a challenge I respond with the CD seen above. Odysseas Elytis (1911-1996) was one of the most important Greek poets of the twentieth century. After fighting against the fascist occupiers of Greece in World War Two he started writing the poem on which his reputation rests and which almost certainly won him the 1979 Nobel Prize for Literature. Axion esti (Worthy it is) is a contemporary epic which progresses forward through history to the liberation of Greece in 1944 and on to a vision of a more peaceful future. It was published in 1959 to great acclaim and in 1960 Odysseas Elytis was awarded the Greek national prize for lyricism. 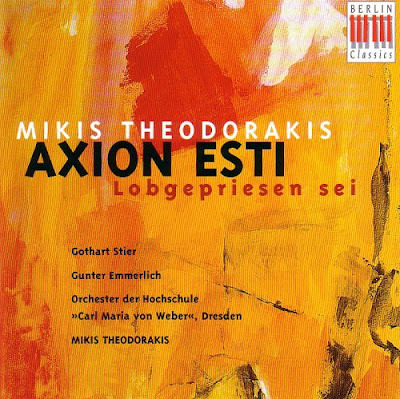 Mikis Theodorakis responded to Elytis' masterpiece with his oratorio Axion esti, which was premiered in Athens in 1964. Like the poem on which it is based, Theodorakis' oratorio immediately achieved immense popularity in Greece with its patriotic tone, sacred Byzantine themes, Greek dances and use of ethnic instruments such as the buzuki and sanduri. In fact songs from Axion esti have become alternative Greek national anthems and are sung on patriotic occassions to celebrate resistance and the overthrow of injustice. So far so good. But....... recordings of Axion esti made in Greece suffered from the limitations of the available musicians. So Theodorakis, who has never disguised his communist leanings, leapt at the chance to record his oratorio with top quality voices and the Youth Orchestra of the Dresden Philharmonic in what was the GDR (East Germany) in 1982. 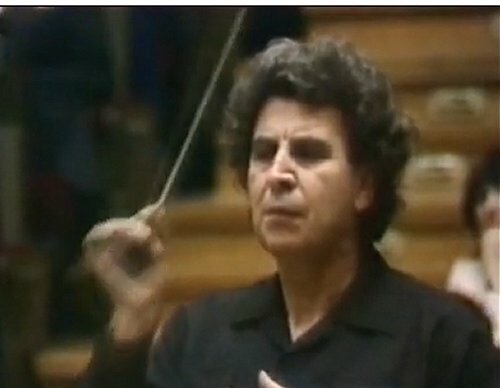 Theodorakis is seen below conducting the concert in Leipzig at which the live recording of Axion esti was made. Sadly, at this point it all goes wrong; because Odysseas Elytis' prize winning celebration of the Greek language was translated into German for the Leipzig recording to become Lobgepriesen sei. I do not need to say much more other than that the Berlin Classics CD, which is conducted by the composer, is a complete recording which include lengthy readings of texts recalling the fascist occupation of Greece, all delivered in German. This Leipzig recording of Axion esti is one of the few discs in my collection that have me laughing out loud, then screaming in frustration, and finally leaping for the stop button, all in rapid succession. To capture the true flavour of Axion Esti in Greek in full-on patriotic mode watch a video of two songs sung in Greek to celebrate the 60th anniversary of the Battle of Crete via this link. Now compare it with the excerpt below from the Leipzig performace. Eat your heart out Wilhelm Furtwängler. * In fairness, Theodorakis' Axion esti does have some beautiful moments. But, for me, it does not achieve the spiritual peaks, even when sung in Greek, reached in his inexplicably neglected Requiem or the moving intimacy of his setting of poetry for voice and guitar. Very interesting post. Your objections to Theodorakis' work done in German are well taken. Regarding Furtwangler I can say with confidence that the recording referenced by Alex Ross doesn't make the best case for the piece. While I make no claim that the WF's quintet will displace Brahms (or even Korngold), I recommend hearing the Tacet recording with the Clarens Quintet; this performance has greater thrust and focus which creates a fine, sustained atmosphere and lends better shape to such broad architecture. I take up the challenge and submit my own worst recording ever--not from a sound point of view, but a comment of the music itself: Ezra Pound's opera Le Testament de Villon (FANTASY RECORDS 12001) is, in my humble opinion, the worst piece of music ever inflicted on humankind. Yes, Pound "composed" the music. He shouldn't have. It is a colossal waste of time and sound. This LP was the only disc in my tens of thousands owned/still owned, that I could not bring myself to finish listening through (with the obvious exceptions of manufacturer's defects) lest I should suffer some form of PTSD. What I did manage to listen to made me physically ill.
Strangely, all his music has recently been released on CD. More for a lark, I'm sure, than for any real artistic merit, other than camp can be entertaining. Not unlike watching Ed Wood's Plan 9 From Outer Space, I guess: one marvels as to why these things were done at all. I am a sort of confused about what is exactly bothering you so much that "Leipzig recording of Axion esti [...] and finally leaping for the stop button, all in rapid succession". It has some points but not that much to freak out "leaping for the stop button". First of all, there was the buzuki top player Karnezis (famous player). The problem was that the excellent voice of Gunter Emmerlich had not the octave range at some points to compensate at the optimum. To be exact, Gunter Emmerlich was the right voice but with not the proper scale for the performance needed. His voice had great feeling, but not the forte. The other problem was the backstage of the whole story. Leipzig at the time was in DDR. DDR this period had reasons to be hasty in support of Theodorakis for political and propaganda reasons and that resulted a hasty performance work. This is obvious even today if someone will study carefully the video. As for the real thing now. "To capture the true flavour of Axion Esti in Greek in full-on patriotic mode" you just have to listen at the edition by the folk singer G.Bithikotsis. That is the most accepted in Greece. Second comes the one by Mitsias. All others are far away down the list. I was surprised that you didn’t cited the original (Bithikotsis) instead you decided that "recordings of Axion esti made in Greece suffered from the limitations of the available musicians".